St. Paul, Minn.—The number of Minnesota babies born outside of a hospital setting rose by 156 percent from 2004 to 2012, according to birth certificate data from the Minnesota Department of Health. More than 1.3 percent of births (904 babies) in Minnesota in 2012 occurred outside of a hospital—mainly in homes and freestanding birth centers—up from 0.5 percent of births (366 babies) in 2004. 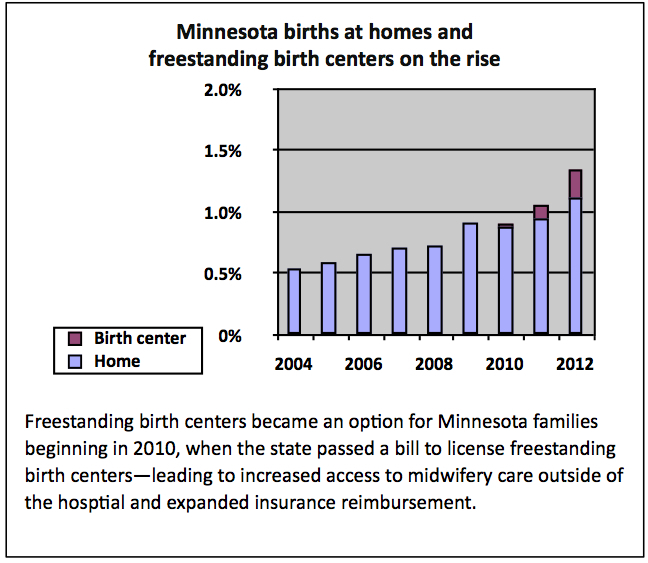 Births occur outside of hospitals more frequently in greater Minnesota than in the Twin Cities metro area. In 2012, 1.7 percent of babies born in greater Minnesota counties were born outside of hospitals, while 1 percent of babies in the seven-county metro area were born outside of hospitals, according to health department data. Nationally births outside of hospital settings have increased since 2004. According to the Centers for Disease Control and Prevention, the percentage of births occurring outside of hospitals increased from about 0.9 percent of U.S. births in 2004 to about 1.4 percent of U.S. births in 2012, its highest level since 1975. In 2012, 53,635 births in the U.S. occurred outside of a hospital, including 35,184 home births and 15,577 births at birth centers. The nonprofit Minnesota Council of Certified Professional Midwives promotes, protects, and preserves midwifery as practiced by certified professional midwives in the state of Minnesota. The council is committed to safe maternity care provided in an out-of-hospital setting. For more information, visit http://www.minnesotamidwives.org.